Thomas Watkins: I don't believe in people having places.Rose: Be a funny world if they didn't. Lady Marjorie Bellamy: Darling, you haven't changed a bit.Elizabeth Bellamy: Haven't I, mother?The second season of Upstairs, Downstairs continues to deliver solid drama and an interesting look at life in Edwardian England. Its fine ensemble cast is joined by some new faces, most notably John Alderton as Thomas Watkins, an optimistic manservant who eventually finds his way to Eaton Place. Alderton and Pauline Collins' characters were spun off for Thomas and Sarah, which ran thirteen episodes in 1979. This would be the last season for several key players, but of those that would remain, Simon Williams, who plays James Bellamy, appears in only two of the episodes. The strict hierarchy of servitude continues to be stressed throughout this season, which adds much of its sublime humor, as the servants boast their superiority in the ranks. The interaction of the downstairs cast is contrasted in their upstairs betters, who find no end to scandal to keep them dealing and conniving to save face. The morality of the age gives way to numerous plot twists, and some pretty controversial subjects for 1970s television, not the least of which being homosexuality, which is both inferred and discussed openly.The producers of Upstairs, Downstairs found themselves in a dilemma when the first season became such a success. It had been decided that the show should take place only during the Edwardian period, but with the first season ending in 1909, there was only one year left before the king's death in 1910—not near enough time to cover another thirteen episodes. They chose instead to remove the opening date references as seen in the first season, and roll back the dates, which meant Elizabeth and Lawrence would return home from their honeymoon before they were married. A bit of a paradox to be sure.Also, when Upstairs, Downstairs aired for the first time in North America as part of Masterpiece Theatre, it was decided to combine the first two seasons into one, since five episodes of the original season were in black and white. This meant that several installments found on this and the first season set weren't aired, creating a few major plot holes, as this is very much a serial. This assembled season won the show an Emmy® for Outstanding Drama Series, with the skipped installments being aired much later as the "lost episodes." Jean Marsh was also nominated for her performances. The New Man"I hate being responsible for other people, it's bad enough being responsible for one's self." - Lawrence Kirbridge (Ian Ogilvy)Elizabeth and Lawrence return from their honeymoon in Vienna, and set up residence in Greenwich, with Rose along as their housemaid. Lady Bellamy (Rachel Gurney) has concerns over the pair's financial situation, suggesting they keep reigns on their servant budget, but Lawrence insists on a manservant. Life in the new house gets off to a somewhat shaky start, as Rose becomes accustomed to the new cook and Thomas, the valet, downstairs, while upstairs, Elizabeth is upset with her new husband's aloofness. Things come to a head in the Kirbridge household as Rose and Thomas become more familiar with each other.This episode introduces Ruby, the new Eaton Place kitchen maid, and Thomas Watkins (John Alderton).4.5 dinner bells. A Pair of Exiles"The family name must be protected at all times from scandal." - Sir Geoffrey Dillon (Raymond Huntley)Word arrives at Eaton Place that James has himself in a spot of financial trouble, having extended gambling debts well beyond his allowance, though his father suspects there must be a woman involved. James, in fact has been financing his gambling from the earnings of Sarah, the former under house parlor maid who has been secretly seeing the young Bellamy since she became a stage performer. He is in way over his head when she confesses she is pregnant with his child—a scandal that could bring ruin to his family.A poignant look at how the upper class treats those beneath them. I'm sure the solution offered here was made many a time in history, though perhaps not as obligingly.4 dinner bells.Married Love"Do you want to be a servant all your life?" - Thomas (John Alderton)Trouble continues to brew in the Kirbridge household, as Lawrence refuses to honor his husbandly duties. Elizabeth's preoccupation with her husband's lack of interest inspires him to confide in his publisher, Sir Edwin Partridge (Charles Gray), who is offered an unusual role in the predicament. A soirée to bring attention to Lawrence's work is put into planning. Meanwhile, Thomas is plying his interest in the benefits of a motorcar for the household, and Elizabeth joins in the conspiracy, much to the disagreement of Lawrence. This episode was one of those left out of the North American first season, which could explain its low resolution presentation here. There are some pretty controversial implications and innuendo that will become more relevant as the series progresses. "I only try to give satisfaction, sir." - Thomas4 dinner bells.Whom God Hath Joined..."How much time do you need to know you've made a mistake!" - Elizabeth Bellamy Her marriage in shambles, Elizabeth (Nicola Pagett) returns to Eaton Place. Upstairs, plans for an annulment are set in motion, but a shocking revelation sets the Bellamy household on end, and another scandal in the making must be averted. Downstairs, a misunderstanding has Hudson taking a dim view of Thomas—one that could ruin his future. Another episode where the set up (Married Love) was not included in the North American release. An eye-opening look at Edwardian legal status for women, with content that would have raised a few eyebrows if left intact during its initial broadcast. 4 dinner bells.Guest of Honour"Just think—in a few hours the King of England's posterior will occupy this very chair." - Rose (Jean Marsh)Eaton Place is all a-buzz when word that King Edward VII will be coming to dinner. The downstairs staff is called upon to make sure everything is perfect for the occasion, which promises to be a major event. However, as the evening wears on an unexpected guest makes an appearance, changing the focus of the evening considerably. The elaborate preparations are fascinating, and the work undergone by the servants to make their masters look good for royalty is duly presented. The kicker provides an ending for a previous story arc. 4 dinner bells.The Property of a Lady"Since my wife's honor is being challenged, I intend to proceed more delicately." - Richard BellamyEchoes of the first season's Magic Casements episode resurface, as a dead soldier's footman (Desmond Perry as Dooley) approaches Thomas with word that he has love letters to his former employer in his possession from the lady of the house. Since the content could prove a considerable embarrassment to the Bellamys, he offers to surrender the correspondence—for a price—which inspires Thomas to come up with his own scheme. However, Sarah's involvement changes his outlook, as both the master and lady try to keep the writings from falling into the wrong hands. Neither The Property of a Lady nor the Magic Casements episode were included in the North American series broadcast; the two add a story arc that brings a whole new dimension to Lady Bellamy's character. This episode also exposes some interesting traits in both Sarah and Thomas. 4.5 dinner bells.Your Obedient Servant"Respect is not something we grade according to title or to wealth Edward. It is a matter for us of what is owed by servant to master." - Angus Hudson With the arrival of a telegram, Hudson's (Gordon Jackson) behavior becomes unusual. Lady Bellamy is out of town, and a disruptive renovation to install new electrical service bells is in the works, so the household is further inconvenienced by the arrival of Richard's brother, Arthur, (John Nettleton), who suspects the butler is up to no good. As Hudson's unexplained disappearances further suspicion, Arthur initiates an investigation of the man, with Richard as an unwilling accomplice. Hudson gets a story to himself this outing, which is welcomed. We also see how attitudes change when the money side of the household isn't at residence. 3.5 dinner bells.Out of the EverywhereElizabeth: There was really no need for you to come.Lawrence: Just for the sake of appearances, that's all. We must do things correctly.There is a new addition to the Bellamy family with the birth of Elizabeth's daughter. Sarah has returned from training as a nursemaid, but the news that the family's elderly nanny will be arriving does not sit well with any of the downstairs staff. Nanny Webster (Daphne Heard) has been responsible for the upbringing of two generations of Bellamys, but the cantankerous woman may be past her prime for caregiving to an infant—something Sarah is not about to let go unnoticed. However, when she brings the matter to Elizabeth's attention, the Bellamy daughter wants nothing to do with it. Sarah must convince her masters to take action before something serious happens to the baby.Lawrence has an ironic exchange with the baptizing priest, and the attitude towards child-rearing by the aristocracy is a focus. Video for this episode contains some color banding throughout.3 dinner bells.An Object of ValueRose: In what way suspicious, Mrs. Bridges?Mrs. Bridges: I don't know Rose. If I did, it wouldn't be suspicious, would it?A priceless heirloom goes missing when Lady Bellamy's recently widowed mother, Lady Southwold (Cathleen Nesbitt), comes to stay at Eaton Place. Her companion, Hodges (Nancie Jackson) accuses the serving staff, and suspicion grows below stairs as to who could be the culprit responsible. Hudson is charged with conducting an informal inquiry, but gossip is rampant, causing all manner of accusations.One of the few episodes to feature an action sequence, this also sheds new light on several of the characters' personalities that we hadn't seen before. The audio track has a faint bleed-through. Somebody stole a dinner bell, leaving four.A Special Mischief"What a night it's going to be. We shall make history." - Ellen Bouverie With her parents and half the servants away, Elizabeth arranges a secret rendezvous of her new found suffragette friends at Eaton Place. Led by her old school friend, Ellen Bouverie (Claire Nielson), the women plan a coordinated attack on a minister's residence, but when Rose tries to intervene, she finds herself in a position she couldn't imagine in her worst nightmares. In order to rectify the situation, Elizabeth must reluctantly engage the services of Julius Karekin (Donald Burton), a man who has taken an interest in the young Bellamy.The measures undertaken and endured to win the women's right to vote is presented here which, if historically accurate, is most disturbing. The audio track has a faint time-code bleed on it.Don't be late for tea. 4 dinner bells.The Fruits of Love"Without money I stay trapped her in the fond embrace of my family until I just fade away into nothingness. I've got to escape!" - ElizabethFeeling trapped by her place in life, Elizabeth takes up with the philandering, but rich, Julius Karekin, who buys her a hat shop as a gift. Lady Bellamy urges Elizabeth to sever the relationship when she finds out about the affair, sensing another scandal brewing, and fearing the man, who is well below her station, is simply using her for his own ends. Her confrontation with her daughter has an unexpected result, however. Meanwhile, the Bellamy household is rocked when the solicitor for Lady Marjorie's father's estate outlines the terms of his will, which includes liquidating his assets, including 165 Eaton Place. Unable to secure finances to cover the unexpected expense, the house is put up for sale, and the Bellamys face losing their lifelong home, unless they can find a source for relieving the debt. The Fruits of Love references Lady Bellamy's relationship from Magic Casements, which, as mentioned above, wasn't part of the North American combined first season. Here, the comments make much more sense in terms of the series, and don't come out of the blue as they would otherwise have.4.5 dinner bells.The Wages of Sin"It's a bit too late to talk about character." - Mrs. Bridges Sarah is spinning tall tales again when the fact that she is pregnant again comes to light. Insisting that she was taken advantage of by a stranger, Sarah is nonetheless facing dismissal from the household. However, with Lady Bellamy out of town, Richard finds a solution to the problem when Watkins, the baby's real father, volunteers to marry the girl. Upon her arrival home, Lady Bellamy has other ideas, especially when she finds out James is en route from India with a new fianc�e, and is determined that he will never see Sarah again. This is a classic episode with Watkins up to his best antics, and some great drama between the Bellamy parents. Christopher Beeny (Edward) was seriously injured in a motorcycle accident, so a new under house parlor maid, Joan (Joan Carr), was brought in to cover his lines. 5 dinner bells.A Family Gathering "Why do all men have to behave as if all women are stupid, silly creatures?" - ElizabethDisillusioned by her relationship with Julius, and having a rough go of her business, Elizabeth decides to terminate the affair. Rose, however, has some words of advice that put a new spark under the young girl. James arrives with his bride-to-be in tow, and the household is to celebrate the occasion, as well as Marjorie's birthday, with a rare family dinner. The evening is complicated when Sarah and Thomas arrive unexpectedly, causing an uneasy reunion, and the festivities are soured by tragic news. The season closer will mark the departure of Sarah, Thomas and Elizabeth, who would not return for the third season. It also sets the stage for significant changes in the English way of life and the world in general.4.5 dinner bells.Upstairs, Downstairs continues to be an engaging period drama, intertwining historically relevant subjects with an insightful look at the class structure of Edwardian society. The second season is fairly uniform in terms of strength of story, with no real duds in the bunch. The eclectic character mix lends ample opportunity for humorous inter-personal conflict, and the diversity in attitudes of both upstairs and downstairs mark a transitional period in English history. Consistently excellent performances make this series very enjoyable. Image Transfer Review: "I dreamed of something more." - ElizabethThe caveat is that Upstairs, Downstairs has never looked great when broadcast. The box indicates that due to the age of the material and the methods used to (not) preserve it, video quality is not up to today's standards, which is an understatement, but at least the potential buyer is given a warning. Once again, with over 11 hours of material, there is a wide range of image quality issues, as each episode presents its own set of problems. The show was shot on video, and the general look is soft and murky, and only slightly better than VHS quality. Colors are fairly bright and defined, but there is an overall green cast to much of the show. Blacks aren't entirely solid, and the image has a tendency to be on the dark side with little shadow detail. While not present at all times or in every episode, there are numerous source defects throughout, including chroma noise, rolling horizontal dropouts, dropped or jumped frames, color bleeding, ghosting, jitter, aliasing, streaking, flaring, rainbowing, random video noise, banding—pretty much the gamut of video-sourced technical flaws. While the source quality is disappointing, none of the problems look to be related to the transfer, other than a lack of color correction (which I'm deducting marks for), with bit rates pinning the meter on 10. With five seasons worth of material for the entire series, it may have been too cost prohibitive to undertake a proper restoration given the extent of work necessary to bring this up to par—if it is even possible. The episodes are surely watchable (some marginally) despite the quality, but certainly don't have the look we have grown accustomed to for a DVD presentation. Audio Transfer Review: Stereo audio is servicable, but does contain a constant level of hiss from the location recording throughout. Sibilance isn't pronounced, and dialogue is clear, though occasionally suffers mild distortion. There is some faint dialogue bleed-through in a few episodes, though it doesn't sound like the same program material. Time-code bleed, which is a chirping sound, is also present on occasion. A couple of episodes also have dropouts in the audio. All of these flaws are source-related, but some, like the level of hiss, could have been corrected with minimal effort in the mastering. Extras Review: "Is my whole life to be tossed aside on the word of some scheming stranger?" - Roberts No extras are included for season two. The discs are presented with four episodes on the first, and three episodes on the remaining discs. Six chapter-stops are provided per episode. The prgogram summaries on the individual case backs do contain some spoilers. 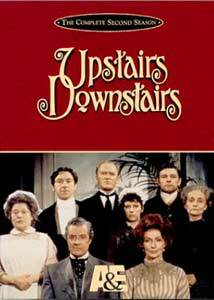 "Oh, what are going to do wif Uncle Arthur..." - SarahUpstairs, Downstairs is a wonderful period drama, rich in character, and populated with a distinct and personable cast. While the presentation here is disappointing due to the neglect the series has endured since its production, the quality of the content outweighs the many technical deficiencies. The stories are highly entertaining, rewarding the viewer with a sense of Edwardian society, contrasting the lives of the servants with their ruling class, and often blurring the lines between them. This second season provides a host of standout episodes, if you can overlook the defects. Highly recommended.